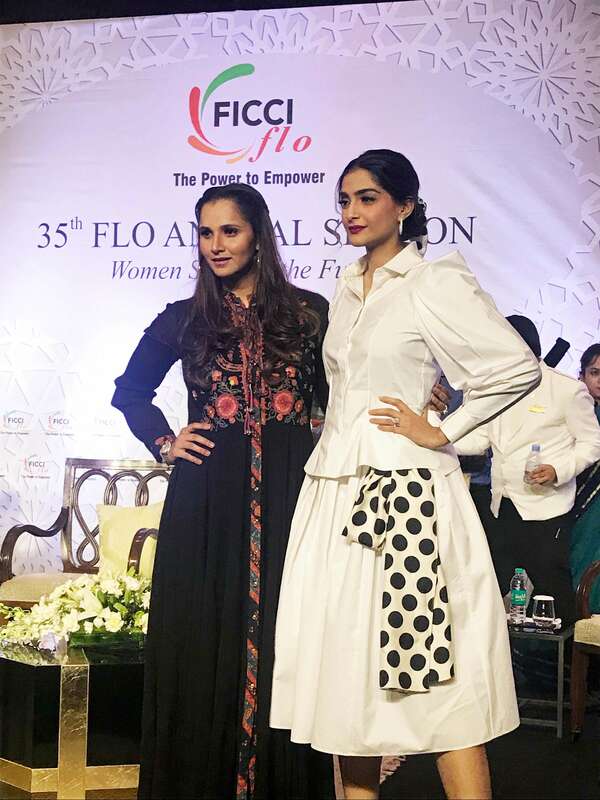 Tennis Champ Sania Mirza and Bollywood cine star Sonam Kapoor Ahuja added sparkle and glamour to the 35th Annual session of the FICCI Ladies Organisation (FLO), the women business wing of apex trade body FICCI here today and Kumar Mangalam Birla, Chairman, Aditya Birla Group as the Chief Guest lent weight to an evening of entertainment, inspiration and some serious talk on gender issues. For the many entrepreneurial ladies of FLO, it was a welcome opportunity to interact with these role models. “In India, we have come a long way in women empowerment but lot needs to be done especially in sports. Despite so many women excelling in sports especially in badminton, wrestling, we have a lot to do for woman. The women should be paid equal prize money in sports, this discrimination is in all sports worldwide” said Sania Mirza, ace tennis player while speaking at a panel discussion “women shaping the future ‘ organised as part of the FLO FICCI annual session. “My only regret is being a tennis player in the nation which loves cricket. And being a mother has made me realize that I Have selfless love in me and made me a better person” Sania Mirza said. “In cine world, I was not treated as an equal and was treated as a woman. But I realized it soon and felt that women should not be the only one who has to compromise. But art is a reflection of society. After marriage, my husband is my cheerleader and as support has added my name in his middle name and has become Anand Sonam Ahuja” said Ms. Cine star Sonam Kapoor Ahuja speaking on the occasion. 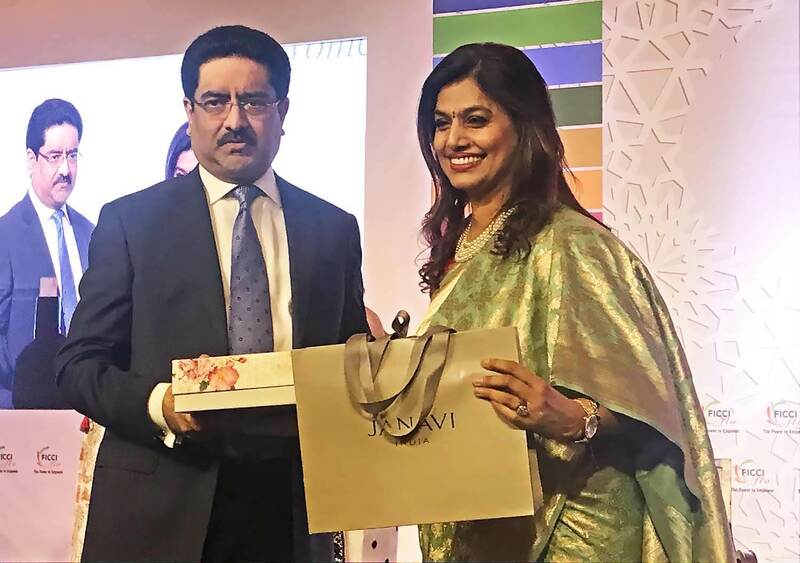 “Corporate world is the biggest platform for social change The companies in the country should move ahead of stereotype jobs for women including HR head and marketing ” added industrialist Kumar Mangalam Birla, who lent a corporate perspective on gender issues. “Every year, the Annual Session is held in the month of April, culminating in a review of the activities undertaken by FLO, as also the milestones achieved during the year. It brings into focus the progress made by FLO in the objectives of entrepreneurship development and professional excellence. The session is a perfect platform for sharing best practices and experiences across 16 locations pan India, in a unified effort to play a catalytic role towards women empowerment. It also marks the ushering in a new year and continuing the legacy that FLO has walked upon, in the past 35 years of its existence.” Said Ms. Pinky Reddy, President, FICCI Ladies Organisation (FLO). FLO annual were presented to women achievers from the grassroots, who have been exemplary through their life and work. The Awardees included women from different fields such as Geeta Tandon, a stunt woman, Deepali an entrepreneur, Kalpana Saroj, running an NGO, Anmol Rodriguez , a designer and Charu Bajaj, CEO, Skills and You” Said Pinky Reddy who was bowing out as President of FLO after a year of valuable work at the helm of the organisation. Harjinder Kaur Talwar, now President is ready to the done mantle as the 36th President of FLO for the year 2019-20.